Club History | Hahndorf Bowling Club Inc. In early 1973, a bowling club was mooted for the community of Hahndorf and a Steering Committee was formed of interested residents with the purpose of developing this concept. 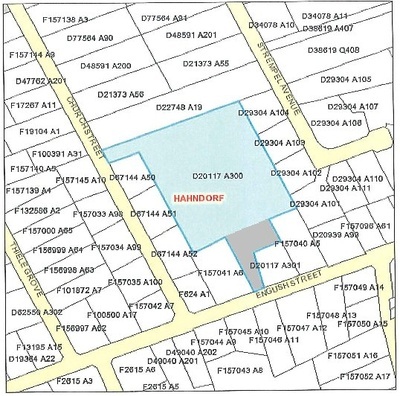 Plan of property from SA Govt Land Services Group (current property is the ‘blue’ plus ‘grey’ sections on one title)Mr Alick Collins owned land which he sold to the Steering Committee at a reasonable price on the understanding that it was to be used for a Community Bowling Club. As the Steering Committee had insufficient funds to purchase the property, it was necessary to apply for a State Government grant which was given on the condition that it was used for Parks, Gardens and Recreation requirements for the Hahndorf community and that the land title was vested in the Mount Barker Council to protect it as a community facility. The Hahndorf Bowling Club Inc. was then formed and then commenced the development of the two bowling greens with provision for a third (current car parking area). It was necessary for the Bowling Club to finance the difference between the State Government grant and the purchase price of the land to enable the greens to be completed. This was done by the Club raising finance via its own money raising initiatives and eventually through a grant under the then Federal Government Regional Employment Development (RED) Scheme for the construction of the bowling greens. The Bowling Club provided all the required tradesmen to supervise the unemployed persons employed under the RED Scheme, and the Hahndorf Lions Club supervised the financial management of the project. The provision of clubrooms was then considered in conjunction with the local Senior Citizens Club (who also required clubrooms) and a joint application resulted in a Federal Government subsidy to erect a building to be shared by both groups. Included in the conditions of this subsidy was a requirement that the two groups were to provide the financial gap between the subsidy and the cost of the building. To cover this gap the Bowling Club agreed to take out a loan with the ANZ Bank, which was guaranteed by certain members of the Club. The Bowling Club further agreed to be solely responsible for paying off the above loan, and also to accept responsibility for all future maintenance and upkeep of the building. In 1985, the Bowling Club purchased an additional area of land to the south and adjacent to the existing property. The original intention was that this land would be used as a possible extra bowling green or car park. The area marked ‘blue’ in the above map is the extent of the property originally purchased for the Hahndorf Bowling Club Inc. to create the Club’s facilities. This is the area on which the Clubhouse, two Bowling Greens, Carpark and outbuildings are located. The land was purchased for the Hahndorf Bowling Club Inc. from Alick Collins on the 8 January 1974 (transfer 3563034) at a cost of $10,000. The land was subsequently transferred by the Club at no cost to The District Council of Mount Barker on the 16 May 1975 (transfer 3744566). The reason for the transfer of the property to The District Council of Mount Barker Council was to enable construction of the Clubhouse and other works to be carried out under a government grant and the RED Scheme which required Council ownership. The address of the property was then referred to as 43a Church Street, Hahndorf 5245. CT 4017 / 268 was subsequently cancelled when the land was incorporated as shown in Deposited Plan 20117 (RT 6283712) and a new Title issued CT 4292 / 684. In the Mount Barker Council meeting held on 2 December 2002, the property under Title Reference 4292 / 684 was Excluded from Community Land. In about May 1985, the Hahndorf Bowling Club arranged to purchase the ‘grey’ portion of land which then formed part of CT 4017/ 271 from Alick Collins and paid him $19,000 for it. As this portion of land had less frontage to English Street than that required by regulation at the time, it was necessary to incorporate the additional land with the original ‘blue’ property which was then owned by the Council. A subdivision of Alick Collins’s land was carried out. At the completion of which portion of the land was transferred to The District Council of Mount Barker on 1 December 1986 for use by the Hahndorf Bowling Club as a possible future car park. The above transfer involved only portion of the English Street allotment. It only related to that portion of the land which formed part of the new Allotment 300. This involved a land division with Council getting part of the land in CT 4017 / 271 and Collins keeping the balance of the land. The address of the additional land was 19a English Street, Hahndorf 5245. From Council and Club information, it appears that between 2000 and 2006 discussions took place in correspondence between the Club and Council as to the possible future use and potential sale of this portion of the overall property. In July 2000, the Bowling Club requested Council sell the land (as it stated no parking area was needed) and that proceeds go towards the upgrade of the clubs facilities. In September 2000, the Council resolved not to sell the land – as it was classified as “Community Land” and therefore community consultation needed to occur to ascertain how best to spend any proceeds should a sale occur (if ministerial approval was granted). In January 2001, the bowling club wrote to Council informing them that the club had reconsidered its position and wished the Council to retain the land for the future use of the club (future use wasn’t specified). In March 2001, Councils Open Space Committee informs the club it will consider retaining the land and asks the club to confirm if it will maintain the back portion of land. In May 2001, the Club confirms they will maintain the back portion of land. In August 2001, Council confirms they will retain the land, and that the club will maintain it. In 2006, Council property assets coordinator identified this land as surplus to Council or club needs and sought valuation on it. I can confirm that at some point between 2001 and present day the land has been excluded from the classification of Community Land, removing the need for ministerial approval for the land sale. Council may however want to conduct community consultation on this. This portion of the property is currently vacant and not used by the Hahndorf Bowling Club, although the Club is responsible for maintaining the property. The current property consists of the combination of the ‘blue’ area plus the ‘grey’ area under the single title CT 5452 / 837 with a Plan Reference D20117 / A300. The address shown on the Title for the combined property is given as 19a English Street, Hahndorf 5245. The current property is owned by the District Council of Mount Barker and leased to the Hahndorf Bowling Club. It should be noted that the Hahndorf Bowling Club Inc. paid the difference in cost between the purchase price and the State Government grant for the original property and the complete purchase cost for the additional property irrespective of any transfers of title to the District Council of Mount Barker. As far as can be ascertained there has been no contribution or reimbursement of any such purchase costs by the Council to the Bowling Club.